The author of a book that is sparking a national discussion among Christians will join members of the West Jersey Tea Party to present his solutions to end social and economic chaos in America. John Horvat II, will present “Getting to the Core of What is Wrong with America: The Case for a Return to Order” on Nov. 21 in Medford, NJ. The event will be held from 7 – 9 p.m. at Braddock’s Tavern, located at 39 South Main Street. The event is free and open to the public. “The economy is on course for self-destruction as a result of ignoring our God-given moral compass, which ultimately keeps everything in balance,” says Horvat. Horvat is an internationally followed author and scholar and is vice president of The American Society for the Defense of Tradition, Family and Property (TFP). In his book and in his public presentations, Horvat draws from America’s rich Christian past to explain the correlation between the economy, faith and moral values. 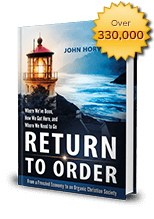 Return to Order: From a Frenzied Economy to an Organic Christian Society —Where We’ve Been, How We Got Here, and Where We Need to Go ranked #1 on Amazon/Kindle in four countries this year, has received dozens of endorsements and has sold more than 25,000 copies to date. 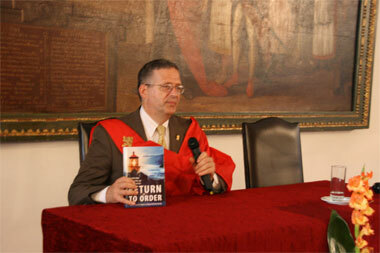 “Return to Order provides an interesting analysis of how the United States has departed from the spiritual, cultural and economic precepts that supported the founding and the early history of our republic. It also sets forth valuable recommendations for restoring our society to its foundation of ordered liberty and traditional values,” says The Honorable Edwin Meese III, former Attorney General of the United States. This entry was posted in Featured and tagged America, economic crisis, frenetic intemperance, Return to Order by RTO.org. Bookmark the permalink.